This Danish Stone Age bread recipe was passed onto me during my travels to Denmark and Sweden this summer by lovely Danish drum-maker, dancer and teacher Susanne Humaidan. 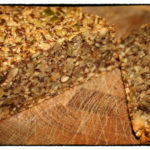 It is not only wheat and yeast free but also easy to make, packed full of protein and absolutely delicious. An amazing breakfast (or other) treat on its own or with organic dairy or nut butters, compote, low-sugar jam, or cheese. Preheat your oven to 160° C.
Lightly beat the eggs, oil and salt in a big bowl. Mix the dry ingredients together in another bowl then incorporate to the first ingredients, stir well until everything is homogeneous. Press the batter into an oiled or parchment paper lined loaf pan. Bake in the middle of your oven for 1 hour or until it is firm and sounds hollow when thumped on the bottom. Wait until the bread is completely cool to slice.